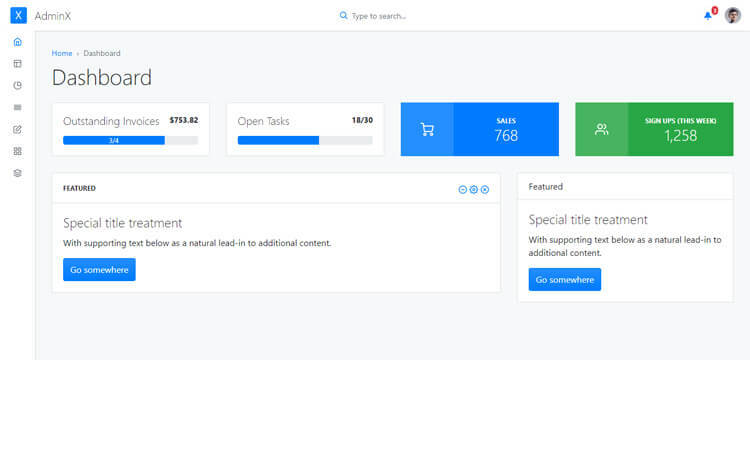 AdminX is a free Bootstrap 4 responsive admin dashboard template. Chart.js and Morris charts are included in the package. Besides, regular and data tables are available with AdminX. Advanced forms along with basic form and elements like button, notification, progress bar, tabs are also provided with AdminX. AdminX is a free Bootstrap 4 responsive admin dashboard template. It is a feature-rich template with a clean, minimal and simple design. Moreover, AdminX is a powerful and dynamic control panel for web apps, admin panel or dashboards. There are six pre-built authentication pages comes with AdminX. Chart.js and Morris charts are included in the package. Besides, regular and data tables are available with AdminX. Advanced forms along with basic form and elements like button, notification, progress bar, tabs are also provided with AdminX. Easy to understand and edit code inside to help you during the development process. Set your project up with AdminX and make a compelling dashboard. Thank you for downloading AdminX. Here are three recommended free Bootstrap 4 responsive admin dashboard templates.